The One, The Only Vegan CBD Softgel! Home/Uncategorized/The One, The Only Vegan CBD Softgel! Get ready to meet the softgel of your dreams. Meet your day head on. Find the perfect product for your lifestyle. You get up early for work, soldier on through the day, drag yourself home, eat some food, rinse, repeat. The idea of going on a run, making a budget, taking that fitness class or going to that social group can feel like more than you’ve got to give. We totally get it. Honestly, we think you deserve better. What Makes Pure Hemp Botanicals™ Softgels Special? We’ve created something truly special. 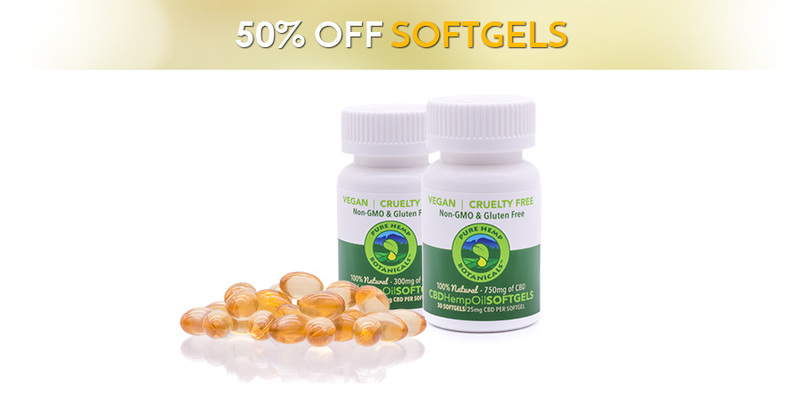 Our CBD hemp oil softgels are one of our most popular products, and for good reason! They’re designed specifically to be easy to swallow, and their vegan ingredients mean that they can be used by just about anyone across cultures and across a range of dietary needs. These all-natural CBD Hemp Oil Softgels are made from a carrageenan-based gel matrix, derived from red seaweed. They contain no animal products—and like all of our Pure Hemp Botanical products—are vegan, cruelty free, and non-GMO. They have no scent, which helps keep them discreet and easy to use in any setting. Our scientists and herbalists have come together to create products that support you all day and all night, anywhere you go. With Pure Hemp Botanicals’ CBD Softgels, you can make the most of your day, no matter where life takes you. Derived from 100% industrial hemp, these CBD oil softgels deliver the delights of hemp in a convenient, consistent dose. Our quality control procedures ensure consistency from one softgel to the next, yielding reliable and predictable results in every batch. We like being able to count on things, and we know you do, too. We make these products for our loved ones, and you can feel it in the quality of every item. Each and every patch gets tested for purity, potency and safety. Our lab ensures that each softgel contains less than 0.3% THC, so you can rest assured that our products are non-psychoactive. Pure Hemp Botanicals prides itself on producing the highest quality hemp products available. Each product that is produced by Pure Hemp Botanicals is put through a rigorous testing process ensuring quality of our end product.